Other features include: air conditioning with heating throughout the boat, generator, hydraulic swim platform, hydraulic gangway, sat TV system with 2 flat screen televisions, radio, Ipod docking station, electric anchor counter, LED underwater lights, teak cockpit floor. Galley: fully equipped galley with hob, oven, microwave, coffee maker, etc. 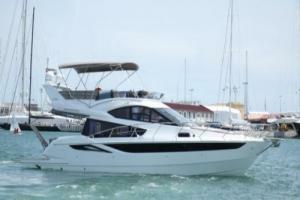 Flybridge: 2nd helm station, wet bar with grill and 2nd fridge. A Williams turbo jet 285 as a dinghy, water skis and tube (2 people), complete safety equipment with EPIRB rescue system. Guest cabins: each with two single beds which can be converted to a total sleeping area.